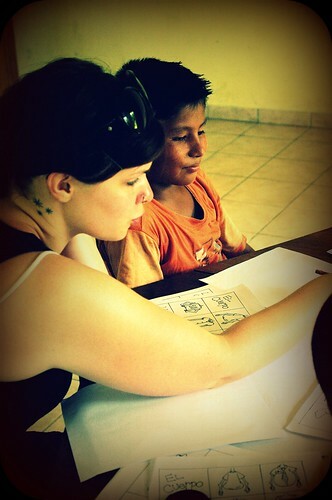 For the past three weeks our team has been working in a boys home about an hour outside the city center of Santa Cruz. A lot of the boys are street kids, or come from rough families. When we first got there, only one out of the nine of us spoke conversational Spanish. That was definitely a huge obstacle–but the boys have been really gracious with us and so far most of us have been able to learn and communicate pretty well with them. Dave has been picking up Spanish really fast, so it’s quite helpful to me ;) Going into town isn’t quite as stressful when your husband knows how to communicate with the locals. I have started doing some art lessons with the kids which was interesting/fun. Trying to teach something with a translator is not the easiest. :) Trying to affirm the boys in their work with the few phrases I know (“Me gusta! Muy bien!”) is probably harder. I usually end up smiling awkwardly and giving the thumbs up. Well, that’s all for now! I’ve got to head to bed, as we are getting up early to make our way to the jungle for a week to dig a well.